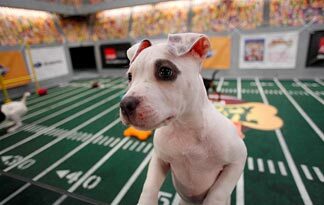 Super Bowl, Schmooper Bowl, The Annual Puppy Bowl Is Here! Too bad that all the puppies you will see have already been adopted, as the Puppy Bowl scenes were made months ago. But, I'm willing to bet that there are plenty of dogs and puppies down at your local pet shelter just waiting to be adopted... and they will be just as cute! Need A Little Help Cleaning The House? The Animal Video Of The Day!!! !